BUSAN, Feb. 28 (Yonhap) -- A Russian cargo ship veered off course and bumped into a bridge off the southeast coast of South Korea on Thursday with a drunk captain on board, authorities said. 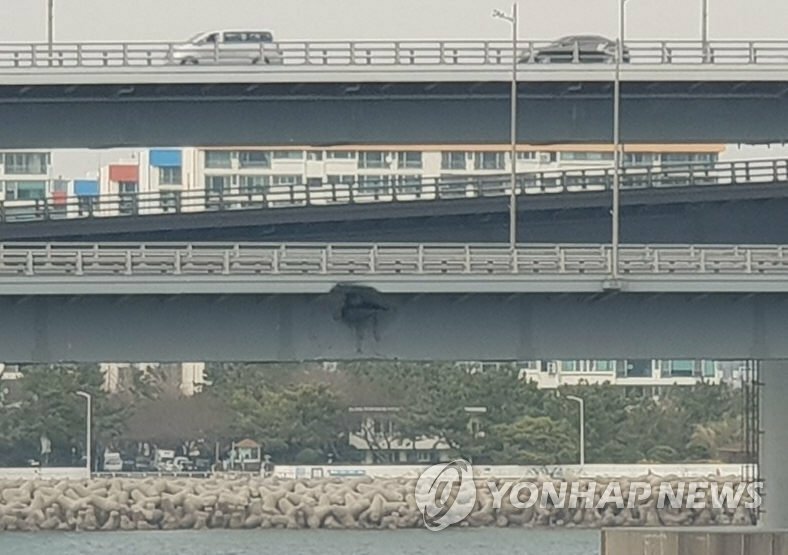 The Korea Coast Guard (KCG) said the 5,998-ton Seagrand sailed into the side of the Gwangan Bridge at around 4:20 p.m. before turning back to head in the opposite direction. The accident caused damage to the lower part of the bi-level bridge, the KCG said. No injuries were reported, but portions of the lower bridge were closed off for precautionary reasons. The KCG nabbed the vessel and questioned the crew aboard. It said the ship's Russian captain, whose identity is being withheld, had a blood alcohol content of 0.086 percent. The legal limit is 0.03 percent. A KCG official said consuming alcohol aboard a vessel isn't punishable by law as long as the person doesn't steer the ship. The official added it wasn't yet clear if the Russian captain had been at the helm at the time of the accident. Authorities were also trying to determine why the ship was heading toward the bridge in the first place, when it should have been going in the opposite direction. The KCG said the Seagrand arrived in Busan around 9 a.m. Wednesday and unloaded 1,495 tons of iron pipes. It was bound for Vladivostok, Russia, on Thursday, carrying 1,415 tons of steel coils. Authorities said the Seagrand had also hit a cruise ship moored at the same port about 40 minutes before hitting the bridge.